Put your education and earning potential on the fast track. Earn a hotel, restaurant and institutional management (HRIM) or hospitality industry management (HSIM) bachelor’s degree and a UD MBA. 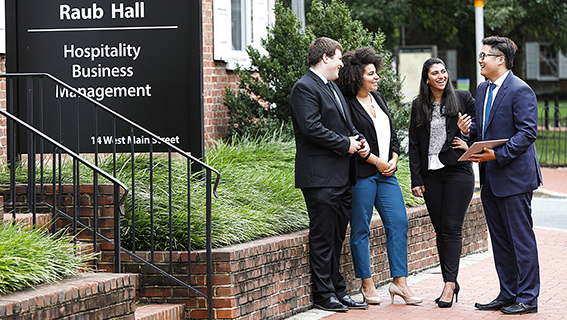 In the accelerated degree program, additional undergraduate business electives and alternative mathematics classes build a strong business management foundation, preparing you for the MBA and making it possible to complete the MBA in one year. The work toward the MBA degree may also be pursued part-time over a longer period. The MBA degree is granted when you’ve completed all requirements with a grade point average of at least 3.0 in courses to be applied toward the MBA degree. The four-year curriculum for HRIM and HSIM majors contains both required and elective courses that qualify as the basis for waiving up to four core MBA courses. With waivers and proper scheduling, you can complete the remaining courses for the MBA degree in one additional year of study (including summer and winter sessions). For an MBA core course to be waived, you must earn a grade of B or better in two undergraduate courses in that subject area. For more details, visit the course waivers & transfers page. You can apply to the MBA program in the first semester of your senior year. Admission is based on the results of the Graduate Management Admission Test (GMAT), GPA, work experience, letters of recommendation, extracurricular activities and, in some cases, a personal interview. If you are planning to enroll in the accelerated degree program, take the GMAT in your junior year. Admission to the program is granted on a provisional basis by the Office of Graduate Studies. Once you earn your bachelor’s degree, the provisional status is removed. If accepted into the MBA program, you may be eligible for graduate assistantships and graduate fellowships. During your first four years in the HRIM or HSIM program, you pay undergraduate tuition and fees. During the fifth year of study, and any additional time if it becomes necessary, applicable tuition and fees are those for MBA graduate students.